I was talking to a friend yesterday and we were talking about what our passions and loves were. He was telling me about the things he enjoyed when he wasn’t working at his full time job and what his passions are. When he asked me and I explained that my passion was pianos and music, he smiled. As I went on to explain that every day my normal routine is to go straight to the internet, check my emails, look at Google alerts I have set up for Piano SD, Pianos in San Diego and Pianos. After I have gotten those read, I usually start with my monthly magazines and once I have spent a little time catching up on the latest in the industry, I move over to the latest book I may be reading. Presently I am reading ALL about MUSIC. It is a study of where music began up to the present age of music. Quite interesting. My friend seemed to look on with a weird look and asked if I was employed in the music industry right now and when I explained that I was not, he could not believe that I spent as much time out of my day every day to stay abreast with the latest happenings. I love pianos. I love the piano industry. 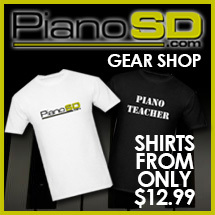 It is an intense industry made up of good people that have a real passion for people, pianos and music. We are all working for a common good. Yes, it is how people make money to live but, its also a way to help other people. Especially kids. If you have kids you should immediately enroll them into a music program. Yes, immediately and it has nothing to do with age. There are programs out there for infants all the way to senior citizens. No matter where you are on your journey through life, there is a place for music. My friend thought I was crazy but, once I explained it to him what my passion is all about and why he smiled and told me that he felt inspired himself because my eyes actually watered up and he said my facial expressions changed. Music is the key folks, music is the key. I hope this wasn’t to crazy of a blog but, just passing along a funny conversation. In the next few weeks I am going to be discussing the difference between blogging and posting and how they affect you and your business. People automatically assume that this is difficult. While posting and blogging is not difficult, there are a combination of words that have to be properly placed together to make sense not only to the reader but, also to the all-important search engines. You must be using this phraseology correctly for the search engines that are constantly reading your posts and blogs to understand what you are doing and then in turn rank your website properly on the search. Additionally, shortly I will also discuss pianos, organs and their origins. I am hoping to continue to bring these programs together as I continue work with dealers, artists and manufacturers building their programs as well.